The city of Escondido is located in San Diego County in California's North Country region just north of the city of San Diego. The city's name, Escondido, means "hidden" in Spanish which seems fitting as it occupies a valley surrounded by rocky hills. The city has four nicknames, Hidden Valley, The Hidden City, The Heart of San Diego North and Esco. The city spans 36.989 square miles has a wonderful Mediterranean climate with summers that are warmer and winters that are cooler than that of its coastal neighbors. The city spans 36.989 square miles, has a mayor-council form of government and lives by the city motto "City of Choice!" The first known inhabitants of the area were a native tribe, the Luiseno and the Kumeyaay migrated through the area as well. Next the Spanish controlled the land from the 1700s into the early 1800s and established a collection of missions intended to teach the native tribes. Later Mexico gained its independence from Spain and gained control of the California lands as well. The battle of San Pasqual in the Mexican-American war was fought just southwest of the site of present day Escondido. America then gained control of the lands and they were made a state in 1850. In its early history the community was primarily an agricultural one primarily raising lemon, orange, olive and walnut trees. The city of Escondido was incorporated in October of 1888. 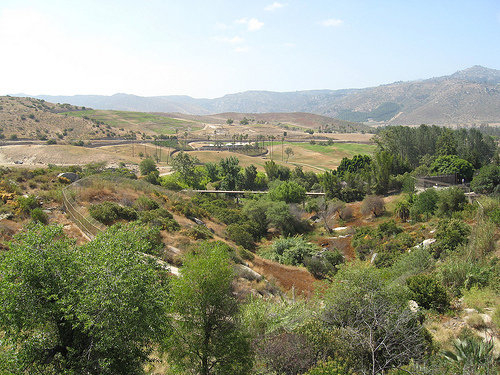 Today most of the agricultural lands have been taken over by housing developments as the city moved from being a rural community to being more of a suburb to San Diego itself. The city has a wonderful Mediterranean climate with summers that are warmer and winters that are cooler than that of its coastal neighbors. According to the United States Census of 2010, Escondido was home to 143,911 residents spread across 45,484 households giving the city a population density of 3,890.7 people per square mile. In 2000, the median household income was $42,567 and the median family income was $48,456. The city has distinct demographic areas downtown and the areas adjacent to it contain more affordable houses and housing options and the outer areas of town, especially to the north, southeast and southwest are hilly and contain more upscale luxury housing. According to the City's 2009 Comprehensive Annual Financial Report the top five employers are Palomar Medical Center, Escondido Union School District, the City of Escondido, Escondido Union High School District and North Country Transit District. Local attractions in or just outside the city include the San Diego Zoo Safari Park, the San Pasqual Battlefield State Historic Park, Queen Califa's Magical Circle in Kit Carson Park and the San Diego Children's Discovery Museum. Homes for sale in the city range from small starter homes up through sprawling luxury properties. Other housing options include apartments, duplexes and houses for rent as well as condominiums and town houses with a variety of amenities for sale or lease. Local real estate agents are ready and willing to help you find the home of your dreams in the lively and breathtaking city of Escondido, California.